There’s just something about That Good Salad. 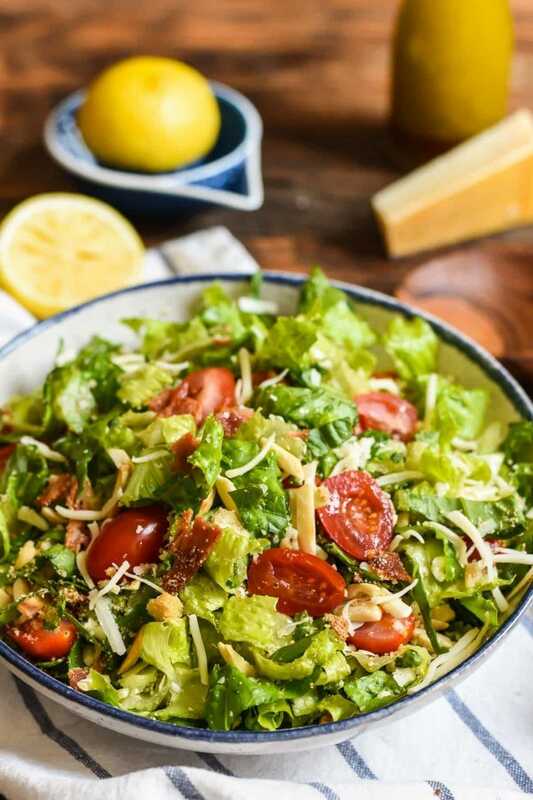 This much-requested recipe has everything a good salad needs–fresh greens, crunchy nuts and croutons, a bright garlic dressing, and bacon, of course! Well, that certainly explained why he hadn’t joined me inside yet. Being the gentleman that he was, he had dropped me off in front of the store 10 minutes earlier and gone to find parking. Unfortunately, as he circled back around the over-crowded parking lot, that same gentleman happened to spot a woman who looked shockingly like me (especially in our matching puffy, black, fur lined winter coats) and proceeded to let out an exuberant “owww owww!” in her general direction. When the woman turned to face him with an expression that was clearly annoyed (and clearly not me! ), my husband shrank into the seat of his car and immediately signed up for the witness protection program. When I got the text, I couldn’t help letting out a little yelp of laughter. I love that I’m married to a man who still wants to cat call his wife but is also genuinely mortified at the prospect of ever cat-calling a random stranger. He’s a good one. We’re kicking off the new year with a salad. I know. I’m so basic. But guys, this isn’t one of those dumb salads you force yourself to eat because it’s good for you, and you made that pesky resolution to eat salad every day in 2017. There’s no “forcing” when it comes to this salad, only asking for seconds. I got this recipe from my best friend, who brought it to a dinner party a few months ago. It was go good, I texted her immediately after she left, begging for the recipe. She texted me back a few minutes later with a picture of the recipe in her family’s cookbook. The title? “That Good Salad.” No other description needed. Of course, I’m a food writer, so I feel the need to give you a little more description. Let’s start with the lettuce–a simple mixture of romaine and curly kale. 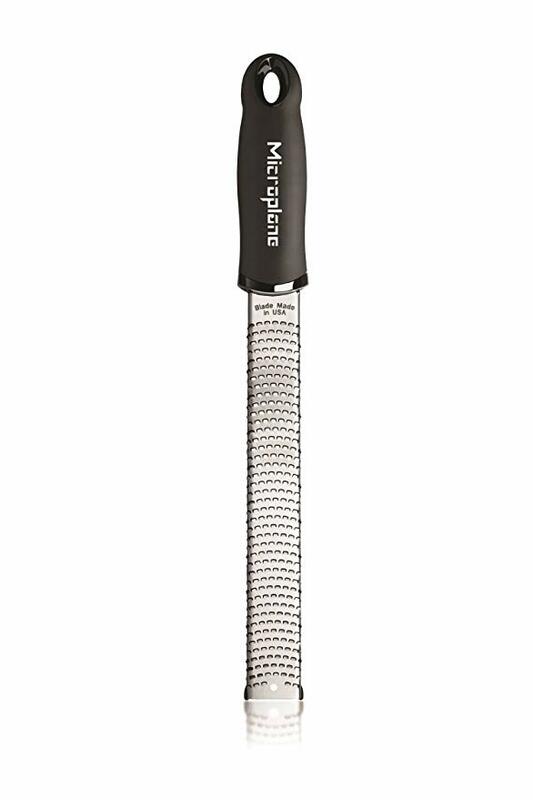 I slice it into thin strips, which is ideal for soaking up dressing and giving you a fresh crunch in every bite. Then there are the toppings–halved grape tomatoes, mozzarella and Parmesan cheese, toasty slivered almonds, crumbled bacon, and croutons. It’s all you ever needed in a salad–fresh, crunchy, creamy, and bacony. That’s like the four food groups of salad, right? 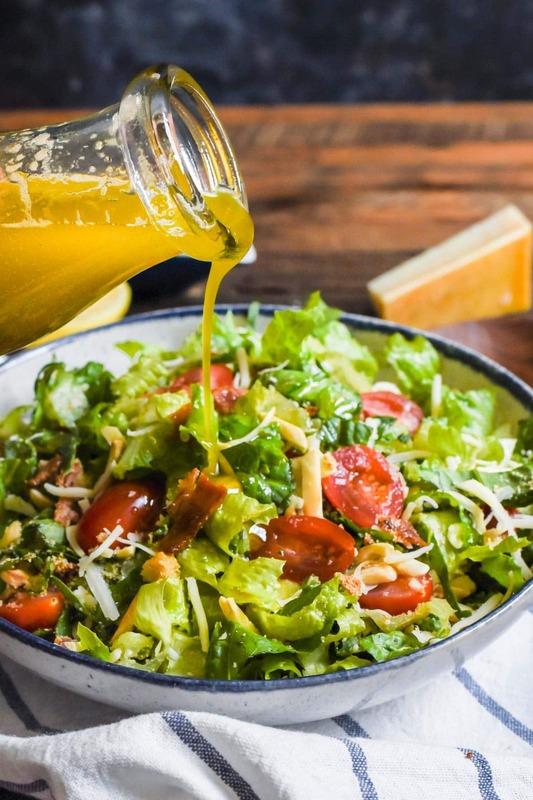 Everything is tossed in the easiest ever lemon garlic dressing. The dressing is bright, but subtle, hanging out in the background and letting all those amazing toppings shine. If I’m feeling feisty, I like to add an extra clove or two of garlic to the dressing for a big pop of flavor. One note about the croutons–I like to rough em up a bit so they’re in small crumbles instead of big honking squares. This evenly distributes the crunch factor and also keeps you from cutting the roof of your mouth on a giant crouton. Win-win. This year, resolve to eat deliciously…and maybe to avoid cat calling people other than your spouse, too. Just a little word of advice from a guy I know. If you’re looking for more salads that don’t feel like a chore, check out my Copycat Northstar Chopped Salad or Mason Jar Chicken Taco Salad! 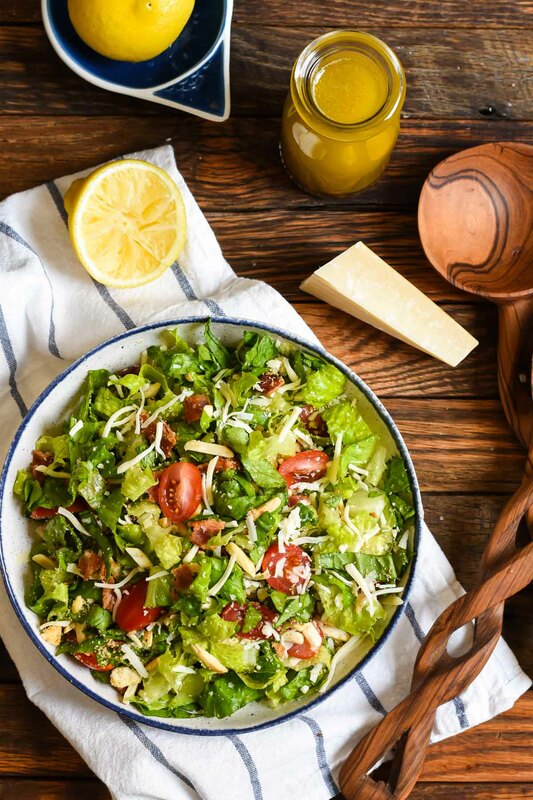 This is my idea of a perfect salad--packed with fresh veggies, plenty of crunch, salty bacon, and Parmesan cheese! Add the bacon to a cold skillet and fry until crispy. Remove to a paper towel lined plate and allow to drain, then chop the bacon into small pieces. In a dry skillet, toast the slivered almonds for a few minutes, stirring often, until lightly browned and fragrant. Cool. Chop the kale and romaine into thin strips. In a bowl, toss together the cherry tomatoes, cheeses, croutons, nuts, and bacon. In a small bowl, whisk together the lemon juice and garlic. Pour the oil slowly into the mixture, whisking constantly. Season to taste with salt and pepper. Toss the salad with the dressing and serve. OMG I was cracking up for a whole minute here. Your poor hubby! And lucky you 🙂 this salad looks amazing–the perfect side for this hilarious story! Right?! The poor guy was so mortified. I still giggle every time I think about it. Well, that’s what happens when you indulge in PDOA! (Public Displays of Affection) Too funny. This dressing looks amazingly simple. I’ve got to try it. Thanks for posting a great recipe to start off the year right. My new favorite salad!! The dressing is so simple to make and is not overpowering. Just perfect! I added half and avocado and a veggie chciken patty and it makes a great lunch! Yum!! So glad I found this! That is awesome! I’m so glad you enjoy it! This salad is aw-mazing and I had to improvise! Decided I wanted to make a salad to take to our neighborhood 4th of July bash and found this recipe. Not wanting to face the last minute shoppers I had to use iceberg & kale, toasted pecans, roma tomatoes and homemade croutons made from hotdog buns. It got rave reviews, especially that awesome dressing. I am making the original recipe for dinner this week. That is awesome! Love your hot dog bun hack. I’m always left with extra buns and I’m definitely going to do that next time. So glad you liked the salad! Would love to know how many people this salad serves and the calories per serving. Other than the croutons, would this be gluten free? I’m thinking of making this for my bunko group and one of our ladies can have no gluten. I’m sorry I didn’t see this comment sooner! YES, this salad is gluten free if you leave out the croutons! You might also want to check the labels on the nuts to make sure it isn’t processed in a facility with wheat. 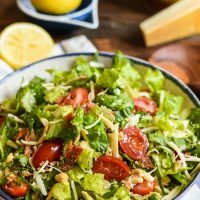 I just made this salad for my husband and in-laws and it was a huge hit! Everyone loved the citrus dressing! I’m so glad! We love to keep the dressing on hand all the time. It’s our favorite part! Hi there. Do you use fresh squeezed lemon juice or is bottled lemon juice ok? I usually use fresh, as I feel bottled can have a really strong, sometimes bitter flavor. Haha! You’re the one who put all the ingredients into the bowl, so you DID make it! Thanks for sharing the recipe though. I really appreciate it! I made That Good Salad earlier this week and it was a big hit with the family. So much so that it was requested again for last nights dinner. Another success enjoyed. We especially like the light dressing. Thank you for sharing the recipe. That’s wonderful! Thanks so much for coming back to let me know. It always makes my day! What kind of mozzarella cheese do you recommend? Fresh (like the kind packed in water) or regular grocery store mozzarella? Thanks! I usually don’t use fresh—either preshredded or block mozzarella cheese will work great. It looks delicious and can’t wait to make it for 4th of July festivities. I have saved this recipe and look forward to trying it. You could absolutely use prosciutto instead of bacon, but I probably wouldn’t recommend the chili on the nuts. I hope you enjoy the recipe! Tried this recipe for dinner tonight. I thought the combination of ingredients was kind of weird, and also that the dressing was really sour. But….put it all together, and it was so delicious. The dressing made the whole salad very fresh. Definitely a keeper! I’m so glad there was a But in that comment. 🙂 Thanks for coming back to let me know! I’m so glad you enjoyed it! I cannot link to the actual recipe with ingredients, even went to blog and same thing there! Was going to make this tonight. Hi Patti! I’m so sorry about that! The recipe card was unavailable temporarily. It should all be back up and running now. Please refresh the page and see if that works. If you have any other issues please let me know! I hope you love the salad!